Anyone who knows me will know I’m perfectly happy to play soulless, dry cube pushing games and I’d much rather have great gameplay over theme every time. However, when great gameplay also has a great theme it’s a beautiful thing. Evolution is one of those games that makes my heart and my brain sing! Everything in this game is deeply thematic yet then lends itself to gameplay so well. Players will adapt and evolve their species using traits to survive in an ever-changing eco-system. Plant food may be scarce and carnivores will try to eat you, will you survive, thrive or become extinct? Place the watering hole in the middle of the table with the food tokens next to it. Shuffle up the trait cards and have this deck nearby. Give each player a species board with the appropriate cubes in the bottom slot and a food bag. Every trait card has a number in the bottom right of the card, some are positive and some are negative. This represents an amount of plant food. 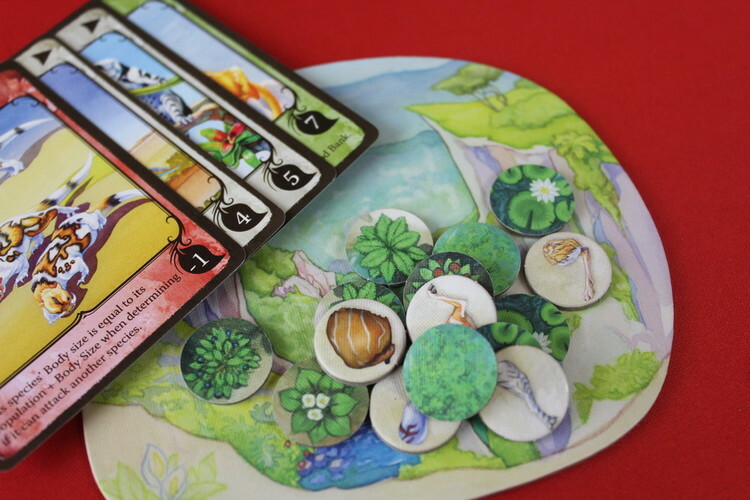 Each player chooses a trait card and places it face down on the watering hole, this will be revealed later and will be the amount of plant food available for everyone this round. Trait cards can be used in quite a few different ways. You may discard a trait card to create a new species. Take a new species board and place markers in the ‘one’ positions on the board. The board must be placed to the left or right of any existing species you have. Placement can be very important when it comes to traits, so pay attention to that when placing a new species! 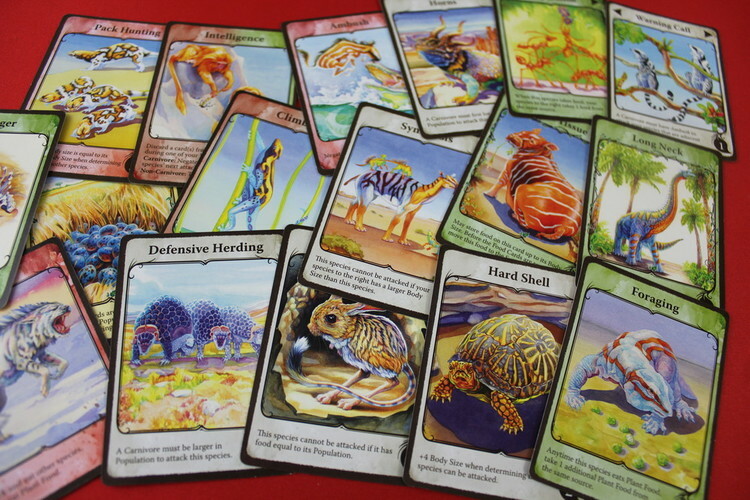 You may also discard cards to increase the body size or population of an existing species. 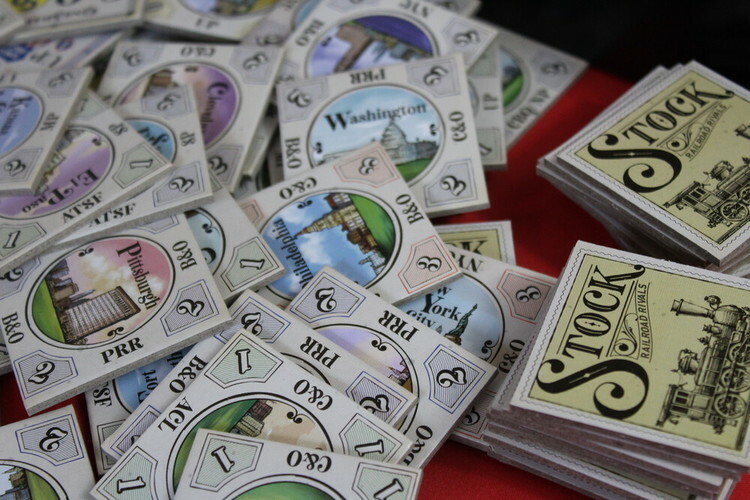 Simply discard one card to move up one space on the required track. You can discard as many cards as you want to do this, but neither your body size nor population can ever go above six. The last use for cards is as actual traits on your species. Place these face down above the species you wish to play it on. You may not have two traits the same on any species and you may only ever have three traits attached to one species. You can, however decide to change traits so could discard one to place another. When everyone has played cards, flip all the trait cards face up. Some trait cards have effects that happen before the feeding cards are revealed (eg long neck, fertile) so check to see if any of these need resolving. Then, reveal the cards on the watering hole and count up the amount of food available this round. Place that many food tokens onto the watering hole. If the total is negative, remove that many tokens from the watering hole if possible. These cards are then placed onto the discard pile. 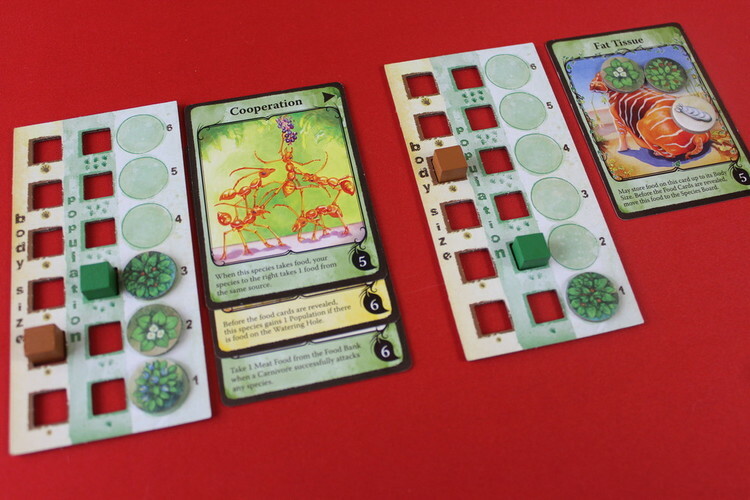 Beginning with the start player and going clockwise, each player must take plant food to feed their non-carnivorous species. A species is hungry as long as it’s food is lower than it’s population. Take one food and place it on the appropriate space on your species board. Some traits will let you take multiple food in a turn, in this case, take as many as is applicable, however, you may never have more food than your population level. If all your species are full, you cannot take anymore food and must pass. Each food you take during this phase will be worth one point at the end of the game. Carnivores cannot eat plant food, so must eat other species to survive. An attack can only be made if the carnivores body size is larger than the species it is attacking and if it can get past any defensive traits. When a successful attack happens, reduce the population of the attacked species by one. Take meat food from the food bank (not the watering hole) equal to the body size of the attacked species and place it on the carnivores board. If a carnivore causes a species to go extinct, the player owning the carnivore may take all food off that species board and place it in their bag. A carnivore may never eat plant food, though there are some trait cards that will allow a non-carnivore to eat meat! Feeding ends either when all species have food equal to their population or when species are no longer able to eat. If a species did not eat food equal to it’s population, reduce it’s population down to the level it did eat upto. If a species didn’t eat any food that species goes extinct. If, for any reason, a species hits zero population, it will go extinct. 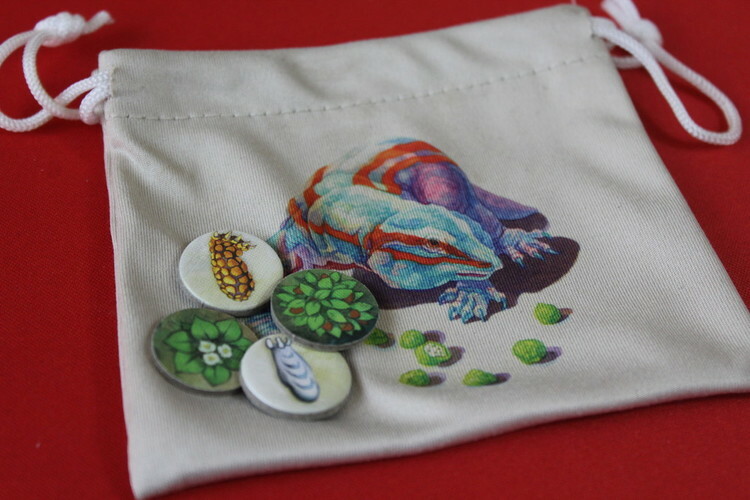 Place any food on the board into the players bag then discard the species board and any trait cards attached to it. Draw a number of trait cards equal to the number discarded. 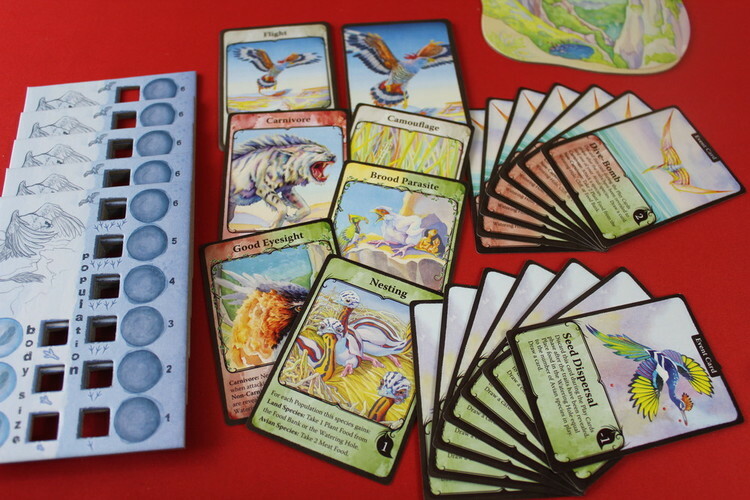 After feeding and extinction have been dealt with, all players put food tokens from their species board into their player bag, any plant food left on the watering hole stays until the next round and the start player token passes to the left. Deal out cards to start the next round! If the deck has to be shuffled during the draw cards phase then this is the last round of the game. If the deck runs out at any other point, finish the current round and play one more full round after. And each trait card on a species is worth one point. In the case of a tie, the player with the most trait cards wins! One of the most satisfying things about Evolution is just how well the theme works - the trait cards all just make sense at a thematic level eg. animals with a long neck get to take one food before everyone else, hard shell gives you +3 body size when being attacked, making it harder for carnivores to eat you. On top of that some of the traits compliment each other creating some interesting and powerful combinations. It all just makes sense and the beautiful, evocative artwork really immerses you in the game. Once you know what you are doing, everyone can play their cards at the same time, leaving traits face down until everyone reveals them, meaning a larger player count really doesn’t take that long. 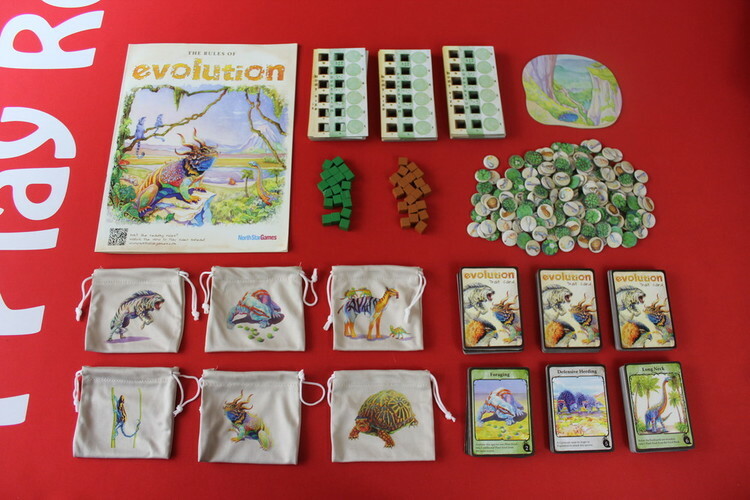 Evolution even plays upto six players which is great when you have an extra person or two at game night. It also has the best start player marker ever! See, everything about this game is awesome! 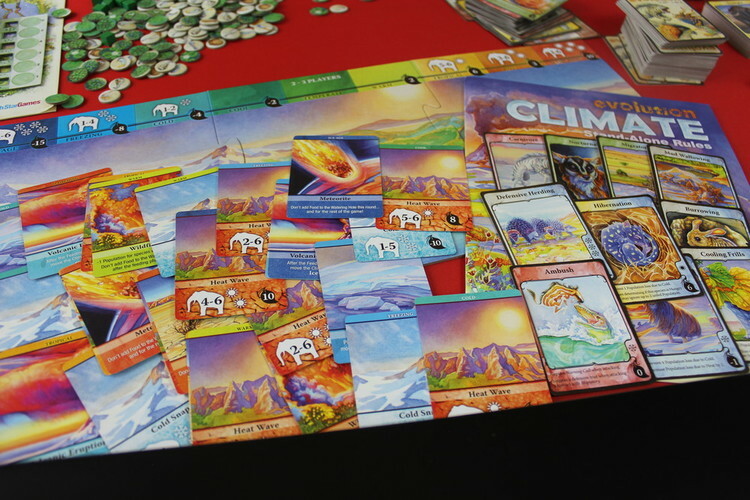 Evolution: Climate is a stand alone game as well as being an expansion to the basic Evolution game. So, instead of just worrying about carnivores and starvation, you now have to worry about the weather that can swing between boiling hot and sub zero. That big fur coat with help you out in the cold, but not so much in the heat! But you don’t need us to tell you too much about it because you can win it below. 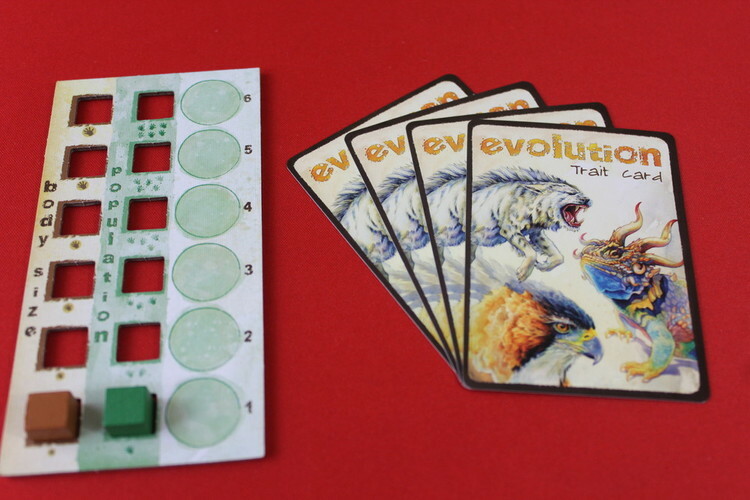 Keep an eye out on Kickstarter for Evolution: Oceans, we can’t wait to see what this adds to an already excellent game.